This time last year, we never thought we would be as involved with the weather as we are today. Always having a healthy respect for the weather, and being super nerdy when squall lines and severe weather threatened Tennessee, Steven and I (Amber) have always been keenly aware to Middle Tennessee weather our entire lives. We both were born and grew up here in the MidState. We’ve grown accustomed to severe weather in the spring and fall. When severe weather is forecasted and starts rolling through, we were glued to the TV. That glue has always been there. From having memories of the Nashville tornado, to the Super Tuesday tornado outbreak, to the epic May 2010 flooding, to the recent February ice storm: we both have stories about the weather and how it has impacted us both. We took that love of weather a step further and attended our very first National Weather Service weather spotter class at Bowie Nature Park in April 2012, with Trevor Boucher of NWSNashville. It was so fascinating to learn about how severe weather forms, what constitutes “severe” weather, how a tornado forms, where the worst parts of a tornadic storm is, and so much more. For the next couple of years we sent in probably around six reports to NWSNashville, mostly of snow events. Not long after we discovered this awesome account on Twitter called @NashSevereWx. I’m not entirely sure how we found out about it, but we loved the insider info that the account provided, and not long after it became our go-to place for finding out what was going on. It wasn’t until this past February when we were iced into our home for two weeks that it dawned on us: why don’t we start a Twitter account for Hickman County? We registered @HickmanSevereWx on Twitter not long after that. We then started working with David at @NashSevereWx and the National Weather Service in Nashville and started providing tweets specifically for Hickman County. With Hickman County, we started with 0 followers, no website, no Facebook Page, and soaking up all the info we could back on March 10th when we tweeted for the first time. You can read about how Hickman Severe Weather has grown here. 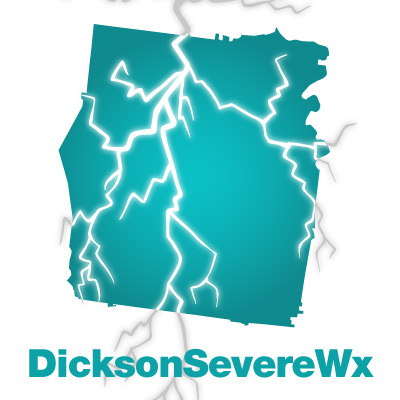 After hitting the ground running with Hickman Severe Weather, we were offered the opportunity to take over @DicksonSevereWx on Twitter. We took over on August 18, 2015. Ever since then, we’ve been covering two counties of which we know very well and live on the county line of both. From August 18, 2015 to 8pm December 31, 2015, we’ve gained 147 followers on Twitter (for a total of 820 followers), gained 50 “likes” on Facebook (after launching a new page), have published 7 posts to this website since October 1st, and have had 127 page loads total. Those numbers still give us chills. We’ve watched every notification of someone following us on Twitter, or liking us on Facebook, and have smiled from ear to ear. We’ve been gitty every time someone has tweeted at us or replied to a post on Facebook, and we stop what we’re doing to tell each other. We are shocked and amazed every time organizations share our stuff on their social media. We still can’t believe that a year ago we never imagined doing something like this, and today we can’t imagine ever giving it up. We weren’t on Twitter when the major ice storm hit the Midstate, but we wish we were. We’ve been here through our lackluster severe weather season this spring, eager to tweet about the weather. We were there Christmas week when we seen the worst severe weather Dickson County has seen all year (outside of the ice and snow storm of February). Thankfully Dickson County only seen minor wind damage. We were here when Hickman County seen its very first December tornado on record, tweeting out exactly what we saw, never taking our eyes off the storm (even when we had to take cover ourselves). We’ve seen some of the best weather this year and some of the worst. We’ve lived it here in a way that we never imagined we ever would. We’ve shared the weather with people we’ve never met, and it’s impacted them in ways we never thought possible. We sincerely thank each and every one of you for the trust and following you’ve given us during 2015. We still smile every time we get a new follower or a new like. We talk about every tweet or comment that someone takes the time to write us. We volunteered for this. We do this in addition to our demanding full time jobs. And we can’t picture it any other way. We do this for our community in which we call home. We do this for our friends, family, neighbors, and fellow citizens. We do this to keep you and your loved ones safe, just as we have kept ours safe for many years with our weather nerdiness. Every tweet you send us, every comment you write us, every favorite/like on Twitter and Facebook, we see it, we feel it, and we are grateful for it. Thank you for trusting us in helping keep your family safe. Of course we can’t do this alone, and haven’t. We have a very long list of thanks. Not only do we thank all (almost) 1,000 of you, but we want to thank those that helped us along the way. Thank you to David at @NashSevereWx on Twitter, who long ago laid the groundwork for Twitter accounts like his and others like ours to be able to do what we do and have the connection with NWSNashville that helps us do what we do better. Thank you for believing in us and helping us get to where we are today, and for continuing to help us learn. Thank you Trevor Boucher with NWS (who used to be at NWSNashville) for connecting us with David so that we could do this for Hickman County. Thank you Sam Shamburger at NWSNashville for believing in us and helping us when we needed it. Thank you for inviting us out to NWSNashville offices and for being a constant point of contact. To all the other #tspotter coordinators, we are thankful to be working with a great team of volunteers and weather nerds who’s desire and wish is to help out our communities. We are glad to have gotten to meet you and know you all over the last year and excited for the next year of weather. We are still very new at this, and learning so much along the way. We can’t do it without those who’ve helped us get here, and for those who follow us and giving us reasons to continue to do this. Thank you for a great 2015, and here’s to a happy, healthy, and safe 2016!